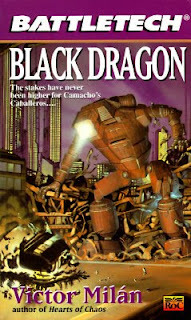 Black Dragon is the third book in the Camacho's Caballeros trilogy that focuses on the mercenary band and their now continuing struggle against the almost mythical Black Dragon Society operating within the Draconis Combine. As with the books before it, a large focus remains to be on Cassie Suthorn, a mech-hating scout who has dedicated her life to being the best at taking out BattleMechs without needing to rely on one. It has made her quite the fearsome scout and commando even though her character does feel a little "too good" at her job to be realistic. This book has the group go to the heart of the Dragon in terms of the Draconis Empire as controlled by House Kurita versus their life on the border of the Combine. And as is often the case with stories set on any of the capital worlds of the Inner Sphere, there's plenty of intrigue and skullduggery afoot that not only threatens the Caballero's put perhaps the fate of the Combine itself. Synopsis: Battletech: Black Dragon is the third book focused on Camacho's Caballeros by Victor Milán. It is set during the Clan Invasion era in the year 3058. After their defeat at the hands of Camacho's Caballeros, the Black Dragon Society is encouraged by a new member to step up their activities and attempt to remove Theodore Kurita from power through any means necessary. Before they had blamed Theodore's advisors as the ones who have corrupted him and led him astray. But now they are starting to buy into the idea that he himself is beyond redemption and must be terminated. So it is somewhat odd when the mercenaries are invited to Luthien for the Coordinator's birthday in recognition of their efforts on Towne. And even on the Kurita homeworld the likes of Cassie Suthorn can't feel safe and she takes it upon herself to do her best to sniff out threats against the Caballeros before its too late. But on a place like Luthien that turns a blind eye towards Yakuza violence in line with agreements made with the criminals, it is more surprising to find anyone who isn't involved in some plot or conspiracy of some sort. What I Liked: I generally enjoy stories of the Draconis Combine a bit more as its easy to fall in love with the Japanese aesthetics to things and the distinct tone that adds to political interactions and such. The very nature of feudal Japanese society that had been adopted for this story just makes them all the more suited for complex plots and machinations. And there's certainly a lot going on, even a bit too many things for the likes of Subhash Indrahar to keep track of. I was also a bit surprised by the appearance of Franklin Sakamoto, who is perhaps better known to those fans who followed the Battletech animated series. By this point it has been revealed that he's actually an illegitimate son of Theodore Kurita and his presence on Luthien at this time is also a opportunity for reconciliation with his father. Not that being all progressive is something that House Kurita is all that know for. What Could Have Been Better: I was not prepared for how they would position Subhash Indrahar for a climactic scene in this book and the scenario felt almost too ridiculous to be real. I can sort of appreciate how this could have been a plan but the way it all turned out just had me raising an eyebrow more than being genuinely amused. There are so many other ways this could have gone better, I feel. Especially for the likes of Indrahar, who has been practically a villain in so many books given his role as spymaster. And the actual mech battles in this book were terribly lackluster, which is always a sort point for me when I read a Battletech novel. Call me cheesy or stereotypical in terms of my expectations, but I don't think it's necessarily unfair to expect a Battletech novel to have at least one solid segment dedicated to a proper mech battle with related tactics and maneuvers and all that fun stuff. Mechs are involved in the finale but not to a satisfying degree. TL;DR: Black Dragon is what happens when you have a writer in charge of a mercenary-centric series of books and have him write them into a key moment in Inner Sphere political history. While it wasn't necessarily a bad book, it did feel like it lacked finesse. And thus the novel gets a decent 3 odd moments of near romantic dialog for the one-note Cassie Suthorn out of a possible 5.